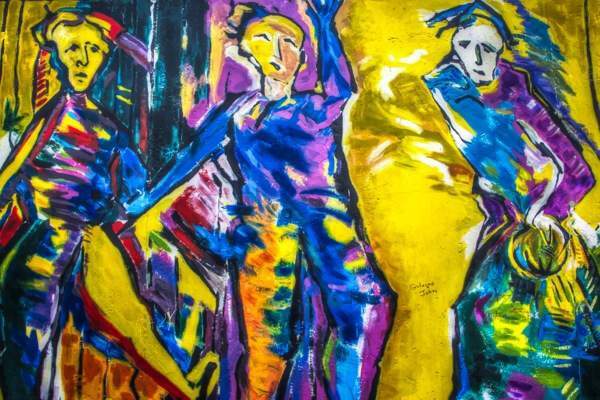 I walked along Berlin East Side Gallery on a gray, windy, and cold day of March, huddled up in my jacket while silently looking at the wall paintings celebrating freedom after the Wall’s collapse, which started on November 9, 1989. As I walked past the artworks, I tried to imagine how the city looked like when it was divided. It’s hard to think that not long ago people of East Berlin were isolated, deprived of their freedom and living in very difficult conditions and I wonder how the Germans living on the other side of the Wall, only a few steps away, could feel knowing – at least in part – what was happening on their threshold. A memorial to freedom, the 106 graffiti are the longest open-air gallery in the world, created in 1990 by international artists, each one interpreting with his own creativity a time of important change and the hope for future freedom in the entire world. Looking at its deterioration, somehow Berlin East Side Gallery sadly seemed the place of oblivion. I was saddened at seeing the deterioration of the paintings, ruined by atmospheric agents and vandalism. 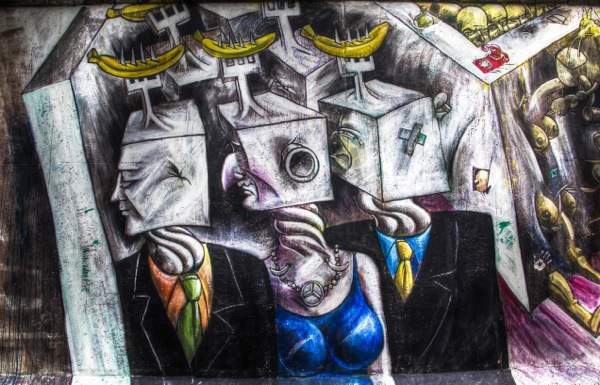 More than a memorial, Berlin East Side Gallery seemed the place of oblivion. Berlin with its beautiful Museums, the ever present traces of the past – the glorious and the infamous -, Berlin so open, tolerant and respectful. How could they possibly let one of the greatest symbols of the 20th Century almost fall apart? Not all artworks are of the same quality, but a few of them – most of which have become icons – haven’t lost their power, the strength of the underlying message. 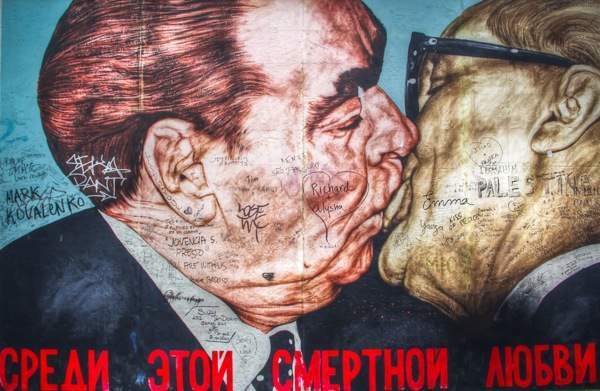 Like Test the Rest, by Birgit Kinder, showing an Old Trabant Breaching the Wall, or the famous My God, Help Me to Survive This Deadly Love, by the Russian painter Dmitri Vrubel, showing the kissing Communist Leaders Leonid Brezhnev and Eric Honecker in 1979 to celebrate 30 years of the German Democratic Republic (GDR) or, in short, East Germany. 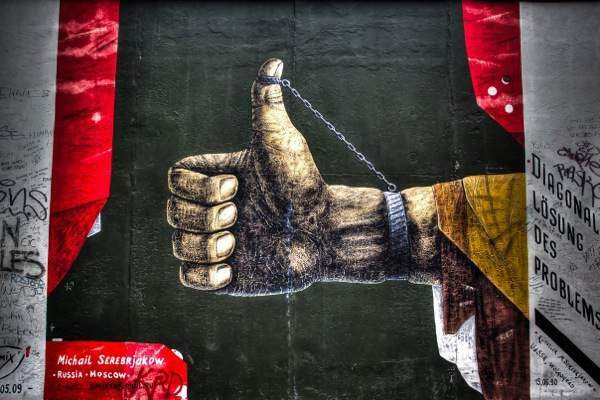 Although less famous, I was impressed by Diagonale Lösung des Problems painted by Michail Serebrjakow and the way it brilliantly associates the universal thumb up with the chain tying it. 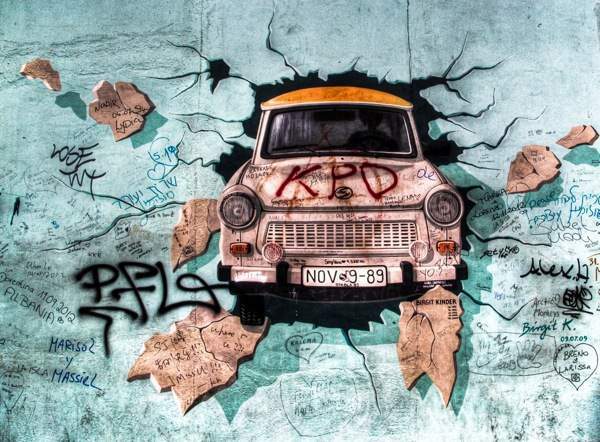 I enjoyed the satirical style of the first wall painting (coming from the Oberbaumbrücke), showing a Trabant whose driver is rushing to cross the border, and other artworks which struck my mind for the beautiful colors and composition, although their meaning remains a mystery to me. 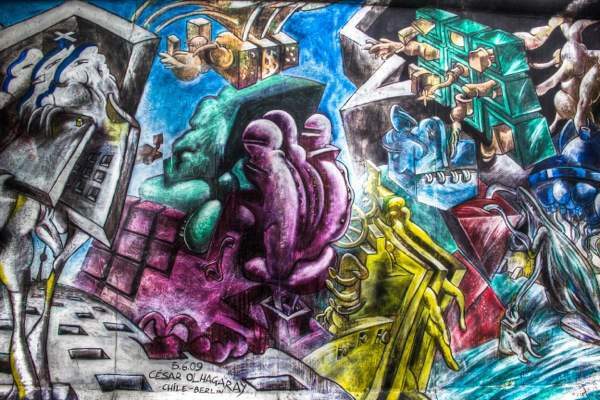 Despite the damages, Berlin East Side Gallery remains a fascinating site, blending art, culture, history. A memorial to the past in the hope for a better future. 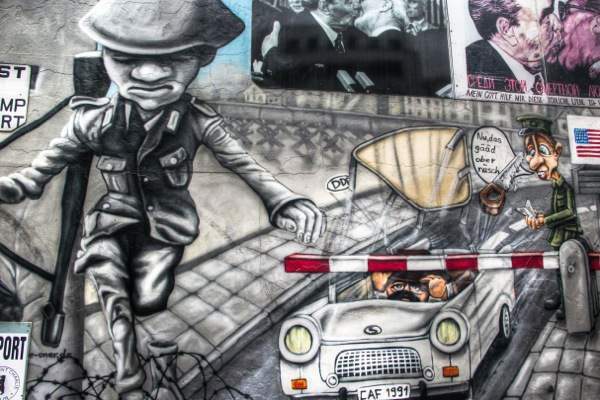 If only for this reason, it’s a must-see in Berlin. Have you been to the Gallery? Which were your impressions? I’d love you to share your thoughts. Travel addict and passionate about photography, Simon Falvo started Wild About Travel back in 2009. Leveraging her strong PR background, she developed an extensive knowledge of Digital Communications and Social Media Marketing. Besides travel writing SImon holds workshops and trainings, she collaborated with tourism boards for digital marketing campaigns and participated as a speaker at several events. I enjoyed reading your view on the East Side Gallery 🙂 We just wrote an article on why we LOVE Berlin, but the East Side Gallery did not make it there – it does have an intriguing history, but the radicalism seems to be undercut by the fact that it is now marketed as a ‘mainstream’ attraction. Even the well-known pieces seem to have lost their edge. There is a lot more radical street art in Kreuzberg etc. It’s always overwhelming to see the East Side Gallery, even more when it’s the first time. I don’t think (though I wouldn’t be sure) that they’ll ever tear it down. It was almost entirely repainted by the original artists in 2010 (if I’m not wrong), as part of the celebrations of the 10th anniversary of the reunited Berlin. What I find really shocking are the dumbass tourists that feel the need to leave their mark on the wall. Seriously, why would anyone do that? Besides that, the greedy politics who sold this ground between Wall and the river Spree should be in jail. Anyway, nice photos, nice article! Really awesome and interesting article..I’ve visited The Wall 2 years ago but you’ve showed it in different and interesting perspective. Thanks for sharing this! Ale! What a wonderful surprise! I never suspected you were following me. And yes, some paintings of the East Side Gallery are really impressive. Hope you’ll come back soon! We visited Berlin for the fist time this May and sadly I must concur with you about the East Side Gallery. Unfortunately the deterioration lessened the importance that it should hold and apart from a few works it became just another street art gallery. This was further emphasised when I saw how other memorials to this terrible time have been so sensitively established and maintained. Great images. Diagonale’s thumbs up is quite impressive. Forced happiness…?? Absolutely fascinating article Simon. What powerful art and intriguing insight into a country’s psyche. Thanks for sharing your impressions. Thank you, Zoe. Certainly other people had different impressions of the East Side Gallery, and that’s what I like when I read about travel: Same place, different emotions and thoughts.